What is a radius ? Definition and examples. 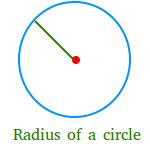 The radius of a circle is any line segment from the center of the circle to a point on the circle. The radius of a circle can also refer to the distance between the center of the circle and any point on the circle. Below, we show the radius with a green segment. 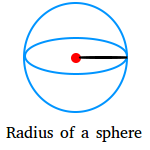 The radius of a sphere is any line segment from the center of the sphere to a point on the sphere. The radius of a sphere can also refer to the distance between the center of the sphere and any point on the sphere. Below, we show the radius with a green segment.